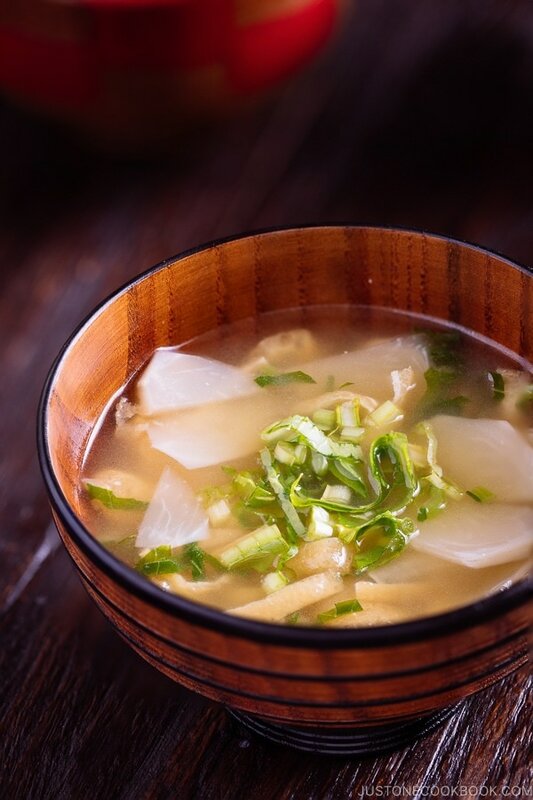 A bowl of piping hot Vegetable Miso Soup is a simple mix of comfort, nutrition, and deliciousness! 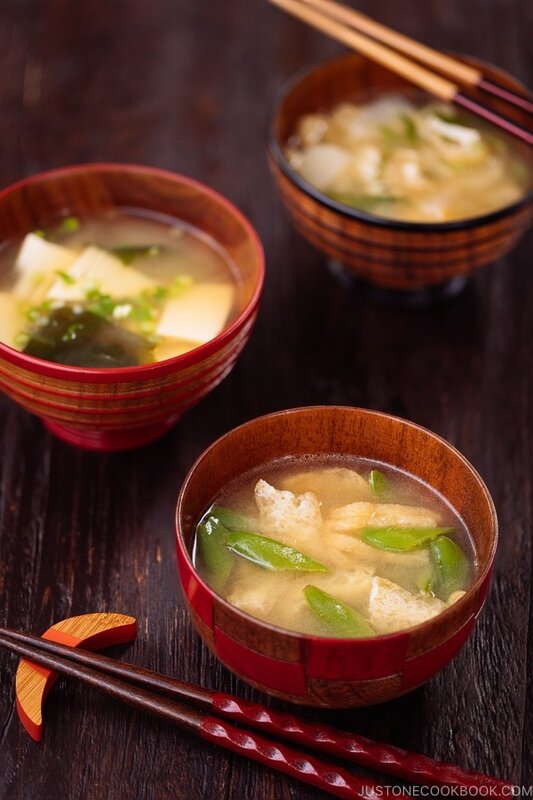 The versatility of Japanese miso soups is also a great way to incorporate seasonal vegetables. 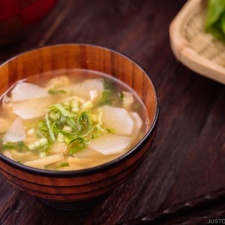 Miso soup is a staple dish for Japanese. It’s basically on the table at least once a day. 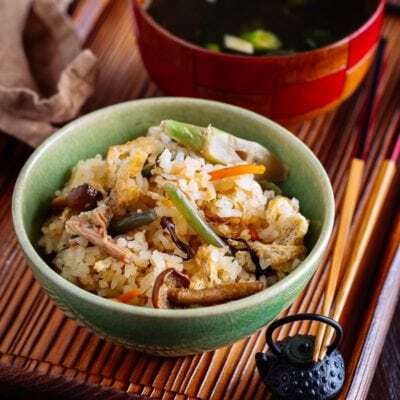 Whenever a bowl of steamed rice is served, you can expect that miso soup will be served as well (not prior to meal time like a Western course meal). 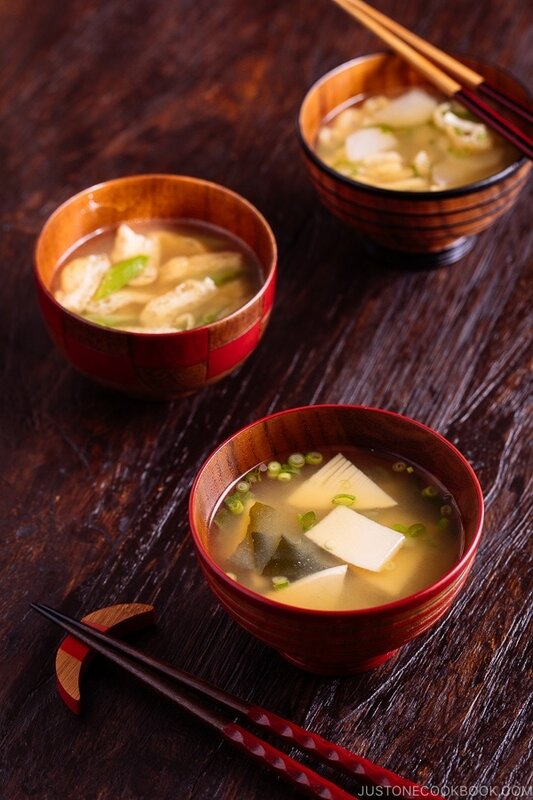 Miso soup and rice are like husband and wife – always side by side. And here’s the important part: miso soup in Japan is not just tofu, wakame seaweed, and green onion. Every day the ingredients vary. 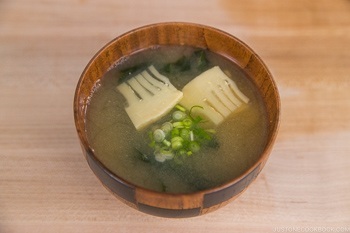 Today I’ll show you 3 kinds of Vegetable Miso Soup (野菜のお味噌汁) that you can easily make at home! 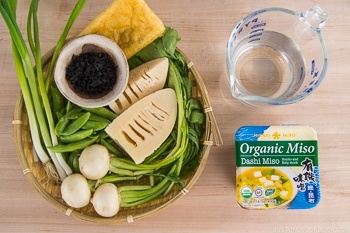 Add ingredients in dashi and cook till they are ready. 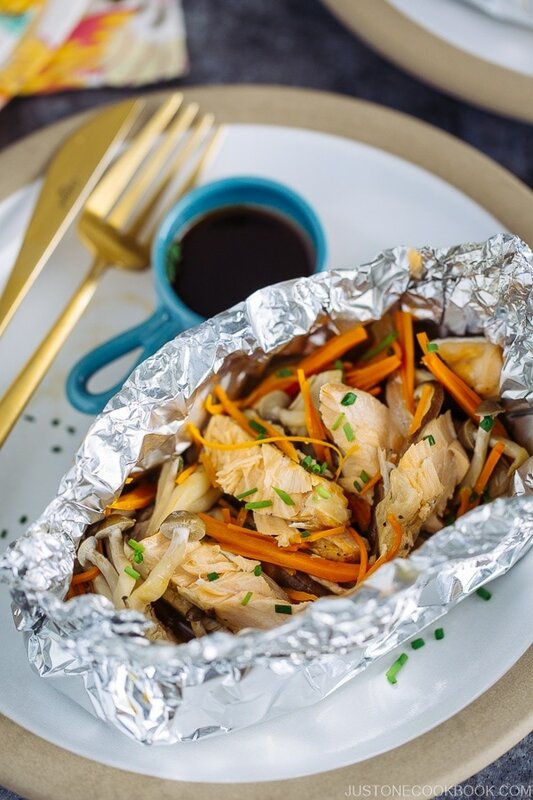 Add miso to taste, and ready to serve! Today, however, we will skip “Step 1: Make dashi”. Are we really skipping the most important part of the miso soup making process?! Is the miso soup going to taste delicious still? Well, yes! Otherwise, I won’t be talking about it. 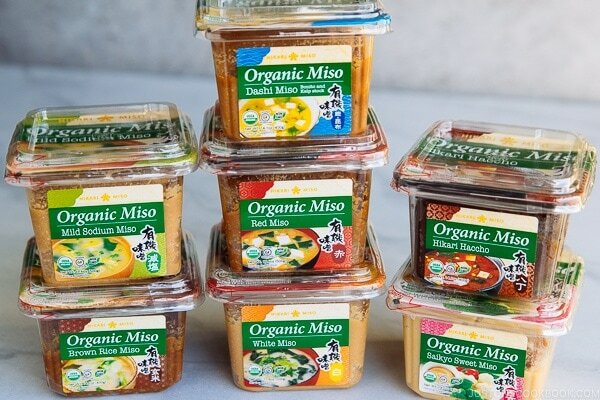 Let me introduce to you – Organic Miso (Dashi Miso) by Hikari Miso. What makes this possible is that katsuo (bonito) and kombu (kelp) dashi are already included in Organic Miso (Dashi Miso) by Hikari Miso. All you need to do is to dissolve the miso paste right before serving the soup. How easy is that? I first learned about this product from Reese, one of JOC team members, who lives in Minnesota. It’s not always so easy for her to get Japanese ingredients where she’s at. 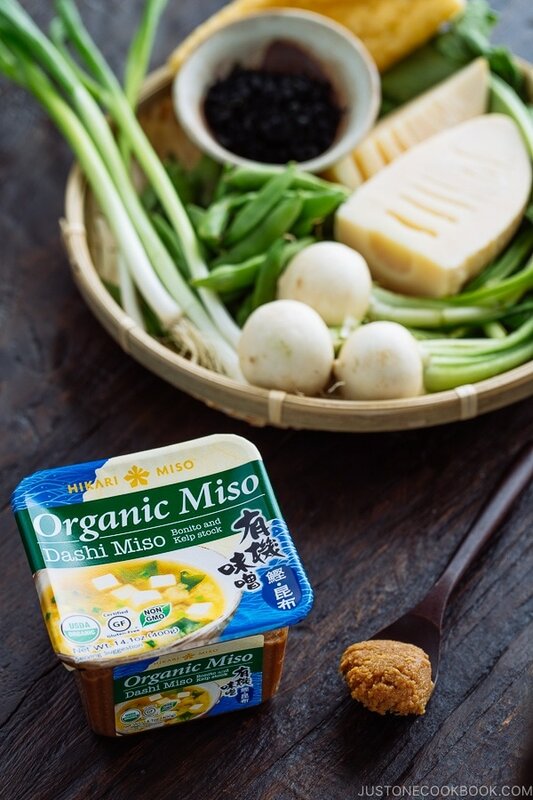 When she discovered Hikari Miso’s Organic Miso (Dashi Miso) at her local Asian grocery store, she was thrilled to try it out. 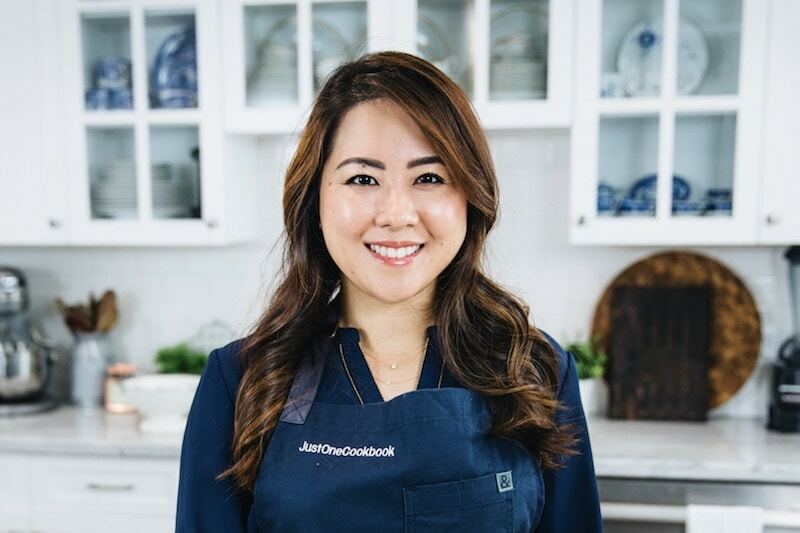 As a mom with a 1-year-old, she is up for anything that can save her time in the kitchen without sacrificing nutrients and flavors. 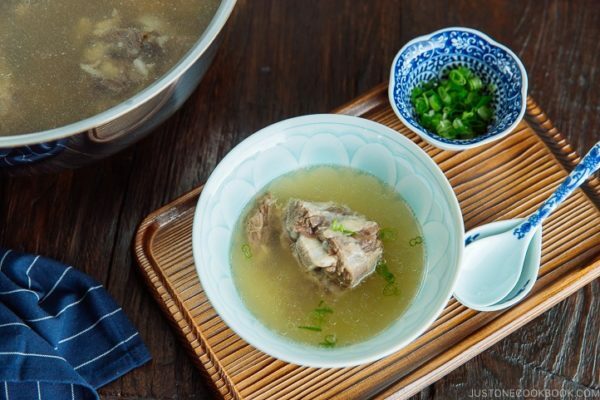 With the extra umami from the katsuobushi and kombu in the miso paste, she no longer has to prepare dashi from scratch whenever she makes her miso soups. 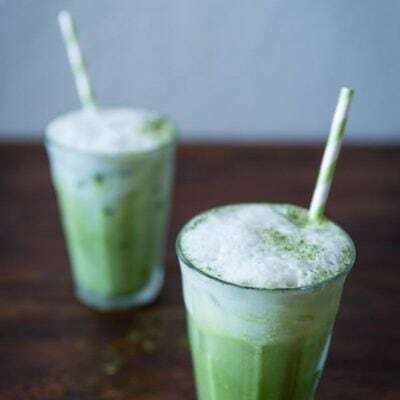 What a great bonus for those who have a harder time to find kombu or short of time! Good things are meant to share, so we know you’re going to be excited to try this Dashi Miso too. When we visited NYC last month, we stayed at our close friend’s house. Our friend who was hosting asked me if I’ve tried miso soup with snap peas. I said no, and she made one for me. The flavor was bright and delicious. When I came home, I decided to combine snap peas with aburaage in my miso soup. The crisp texture of snap peas and the cushiony tofu pouch, it really couldn’t be more enjoyable. 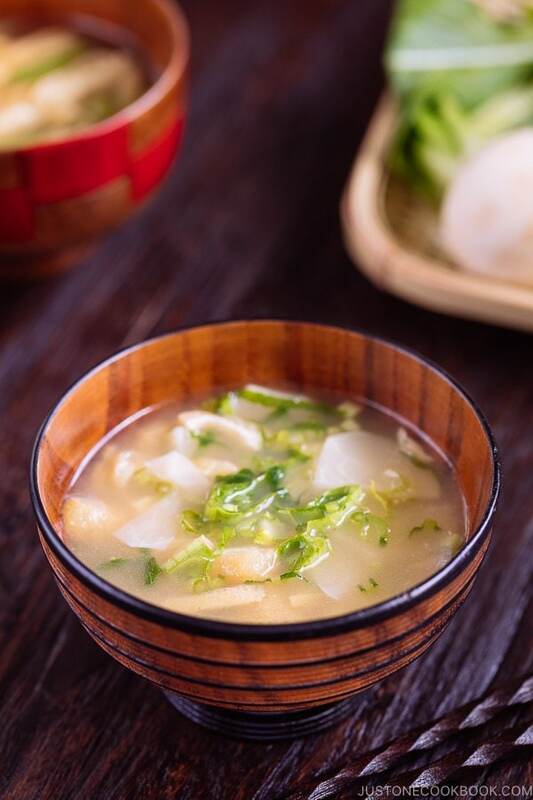 Bamboo shoot is one of the classic spring ingredients in Japan. 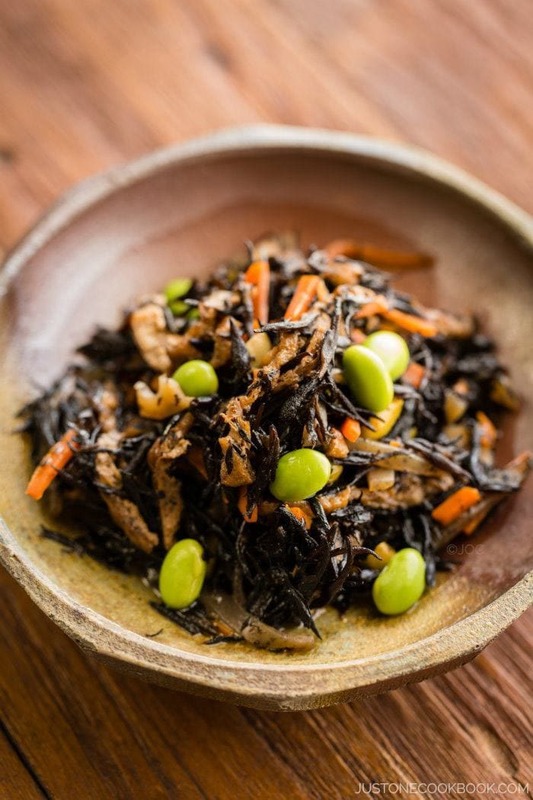 Wakame seaweed always goes well with bamboo shoot. Where do we get bamboo shoot? Most Japanese and Asian grocery stores carry pre-boiled bamboo shoot in a package. 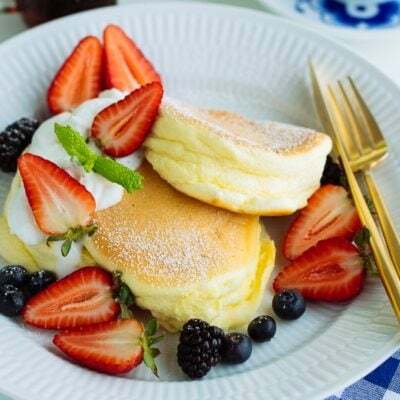 It’s easy and quick to cook. I relish the mild sweet taste and crunchy texture of Japanese turnips. We enjoy the leafy greens of the turnips too. One of my friends told me that American farmers’ markets carry Japanese turnips so be sure to check out your local farmer’s markets. Whole Foods or some upscale grocery stores may also carry these popular Japanese turnips. If not, you may have a better luck at Japanese grocery stores. This Organic Miso (Dashi Miso) by Hikari Miso contains katsuobushi (dried bonito flakes) which is made out of dried and fermented tuna. It is not vegetarian-friendly. For those who are vegetarians or vegans, you will need to make Kombu Dashi for these vegetables miso soups. Fortunately, kombu dashi requires little effort. So long you can get hold of kombu, it is as simple as soaking a piece of kombu in water for several hours. And there you have a vegetarian/vegan-friendly Kombu Dashi. With the kombu water, you just need to heat it up, and right before boiling, discard the piece of kombu, and the dashi is ready to use. Just treat this kombu dashi as “water” appeared in today’s recipe. 1. 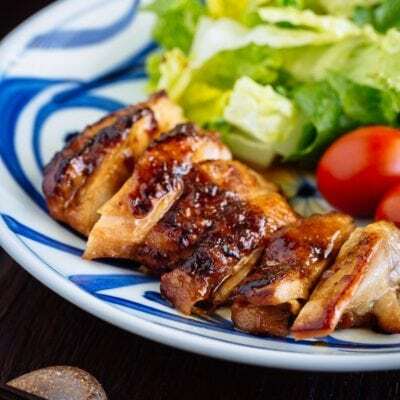 Cook root vegetables first, then add softer ingredients: Because stir-frying requires cooking oil, we do not stir fry vegetables for miso soup unless meat is added, like Tonjiru (Pork Belly and Vegetable Miso Soup). Instead, we boil the root vegetables in the water, and then add the softer ingredients and leafy greens at the later stage. 2. Add miso right before eating: Turn off the heat when you add miso. You always want to add miso last to keep the fragrance and taste. 3. Never let miso soup come to a rolling boil: Re-heating is okay, but be extra careful not to boil. Miso is a fermented soybean paste which contains live, active cultures of bacteria (like the good bacteria in yogurt). Boiling the miso soup will kill the probiotics in the miso. Extra Note 1: Tofu is edible right out of the package. Therefore, for miso soup, you will need to just heat up the tofu. There’s no need to “cook” the tofu. Extra note 2: Wakake seaweed is still salty when you take out from the package. 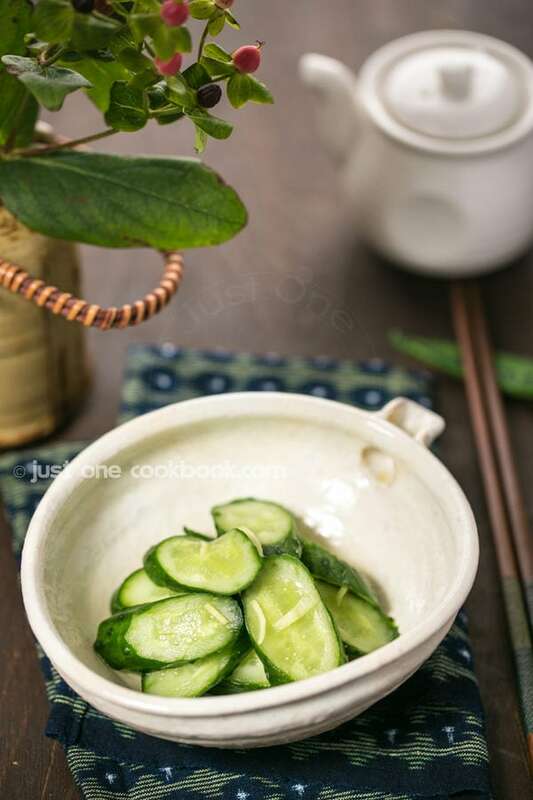 You will need to first rehydrate it in the water and discard the salty water before putting the wakame into miso soup or straight to miso soup bowl. Follow these basics, you’d be ready to create irresistible miso soups anytime of the year. Vegetable Miso Soup is one sure way to eat more greens and seasonal vegetables. As the season progresses, the ingredients change so you can never get tired of it. Cut off the ends and peel the turnip. Cut the turnip in half and thinly slice the halves. 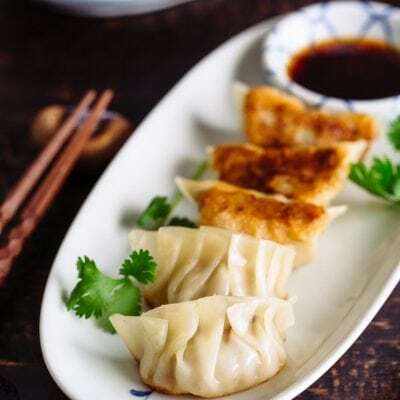 To remove the oil from aburaage, you can either pour boiling water over the tofu pouch in a sieve over the sink, or have a quick blanch over the boiling water in a small pot for 15 seconds (flipping 1-2 times). Once that’s done, cut the aburaage in half widthwise, and cut thinly. Keep the other half for future use. In a small saucepan, add 1 ½ cup water, sliced turnip, and the aburaage. Cover with the lid, but keep it slightly ajar to avoid boiling over. Bring it to a boil over medium heat. Once boiling, lower the heat to simmer and cook the turnip for 5-6 minutes, or until it’s transparent. If you wish to add the turnip leaves into the soup, quickly chop the green leafy part of the turnip. Add some into the soup and save the remaining greens. At this stage, make sure the soup is hot and you’re about to serve miso soup. What to do with the rest of chopped leaves? 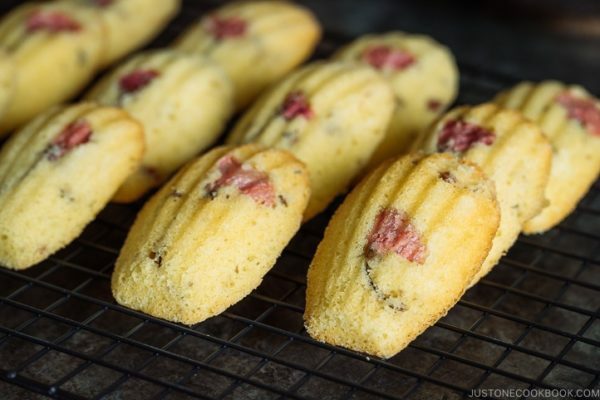 Read Notes for a quick delicious recipe. Make sure the soup is hot as we will not reheat and turn off the heat. Add miso into the ladle, NOT into the soup. Use a pair of chopsticks (or fork) to dissolve the miso completely in the ladle before releasing into the soup. ALWAYS taste the miso soup before adding more miso. Serve immediately. If you need to reheat the miso soup, make sure not to let it boil, once you see steam coming off, you can turn off the heat. Soak the dried wakame seaweed in water for 5 minutes. Drain, squeeze water out, and set aside. 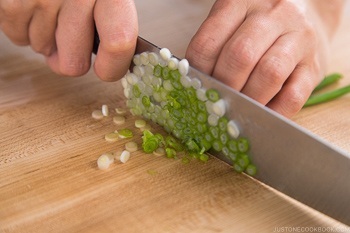 Cut the green onions thinly and set aside. Cut the bamboo shoot into small bite size thin pieces. 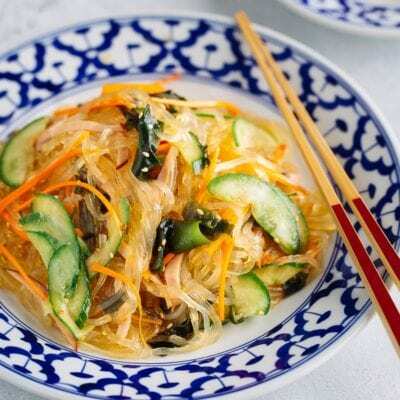 In a small saucepan, add 1 ½ cup water and sliced bamboo shoots. Cover with the lid, but keep it slightly ajar to avoid boiling over. Bring it to a boil over medium heat. Once boiling, turn off the heat. Make sure the soup is hot at this stage as we will not reheat. Add miso into the ladle, NOT into the soup. Use a pair of chopsticks (or fork) to dissolve miso completely in the ladle before releasing into the soup. ALWAYS taste the miso soup before adding more miso. Serve immediately. If you need to reheat the miso soup, make sure not to let it boil, once you see steam coming off, you can turn off the heat. Pull off the tough string that runs along the length of the pod. Then cut in half diagonally. 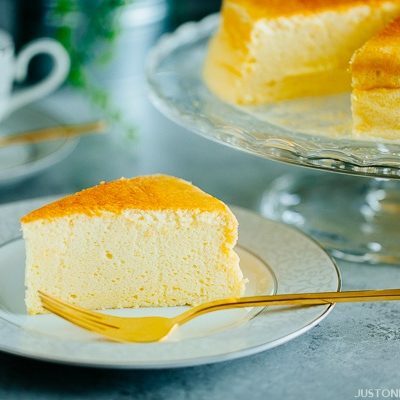 In a small saucepan, add 1 ½ cup water and aburaage. Place the lid, keeping it slightly ajar to avoid from boiling over. Bring it to a boil over medium heat, and once boiling, lower the heat to simmer. Add the snap peas and warm them for 2 minutes on a simmer (don’t overcook). Turn off the heat. Make sure the soup is hot at this stage as we will not reheat. Add miso into the ladle, NOT into the soup. Use a pair of chopsticks (or fork) to dissolve the miso completely in the ladle before releasing into the soup. ALWAYS taste the miso soup before adding more miso. Serve immediately. If you need to reheat the miso soup, make sure not to let it boil, once you see steam coming off, you can turn off the heat. 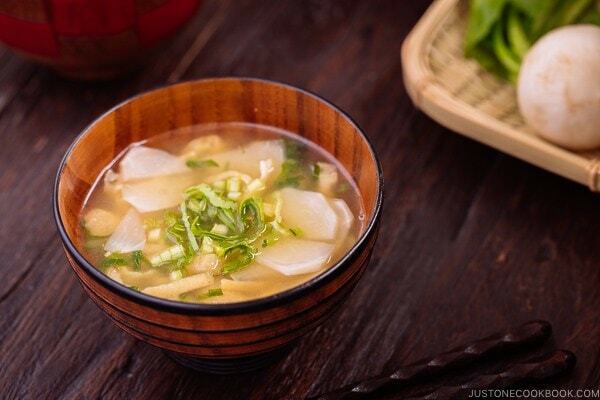 Miso: General guideline is 1 Tbsp (18 g) per ¾ cup (175 ml). Each miso paste has different salt content; therefore adjust the amount accordingly. Japanese turnip: Unlike western turnip, the Japanese ones are milder and sweeter. You can replace with other turnip, but the taste will be slightly different. Leftover turnip leaves: You can stir fry the rest of chopped leaves in sesame oil and season with a little bit of mirin and soy sauce. 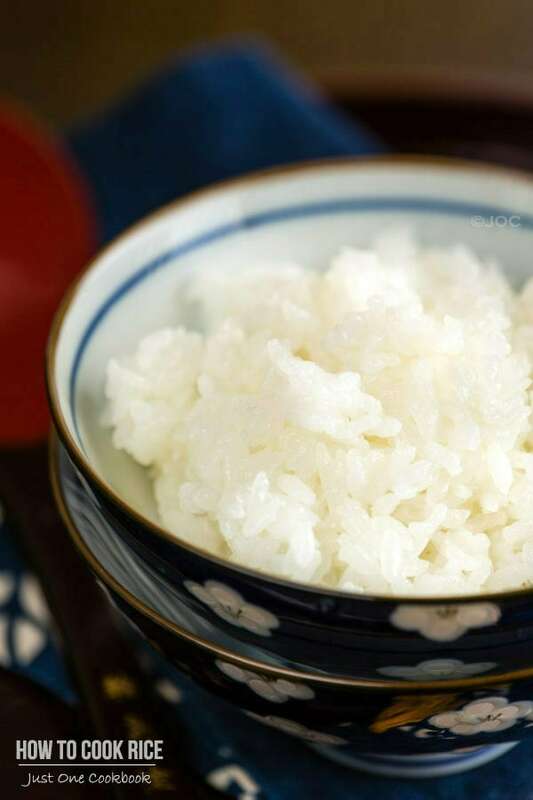 Sprinkle sesame seeds and enjoy it with steamed rice. 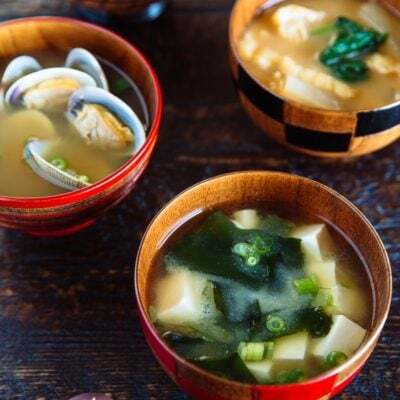 Thank you so much for this miso soup recipe Nami! I can’t wait to try making this at home. 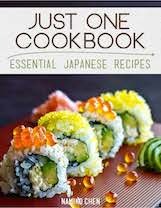 I’ve been wanting to make my own miso soup at home but just haven’t tried yet. Can’t wait to try this! When I was in Japan in July I went to a restaurant called Sushi Zanmai near the Asakusa train station. Hi Darlene! Spinach changes color as you cook, so we do not add till the end in order to keep the bright color. Therefore, you need to blanch the spinach, drain, squeeze water out. 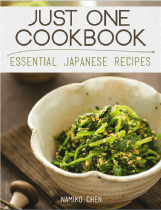 Either you place it in the bowl and pour miso soup or you top the miso soup over the boiled spinach. Make sure not to overcook spinach. 🙂 Hope that helps!